Mr. Md. Sabur Khan is a pioneer self-made businessman, education provider and IT specialist in Bangladesh. 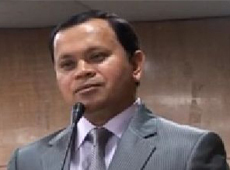 He was the former president of Dhaka Chamber of Commerce and Industry (DCCI) for the year 2013, and also the former president of Bangladesh Computer Samity (BCS). Mr. Khan completed his B. Sc. (Hons) and M. Sc. from Jahangirnagar University (JU). Sabur Khan started his business career in 1990 with a public listed company named, Daffodil Computers Limited (DCL). At present, he is the Chairman of Daffodil International University (DIU) & Daffodil Group. Sabur Khan has a number of international representations including, Asian University Presidents’ Forum (AUPF), International Association of University Presidents (IAUP), International Association of Universities (IAU), Asian-Oceanian Computing Industry Organization (ASOCIO), World Information Technology & Services and Alliance (WITSA), and many more in different times. Besides, Mr. Khan has many presentations in various social, cultural, international and business organizations. Because of his outstanding contribution in the field of business, education, IT etc; Mr. Sabur Khan has received many awards, rewards and Gold medals from various home and abroad organizations among them in 2013 he was awarded amongst the “Top 10 Business Leader in Asia.” In the same year, he also awarded the “World Education Congress Global Award” for his outstanding contribution to education.